Estimating the size of the world’s communications. I think about email a lot because my company makes email software. I was talking with a friend yesterday and it got me thinking, just how much email is there, anyway? So, I looked. A lot of email, it turns out. Like, a whole lot. In 2013, humanity sent about 150 billion emails each day. That’s 21 messages received per earthling per day, or 79 each if you only count actual email users. Big numbers are big. After a point, they become so immense that it’s impossible to have any real, intuitive understanding of what they mean. At least one unsourced estimate says a person will travel 3,658,753 miles in their lifetime. My own estimate puts it closer to 6 million. Imagine that you lived your whole life moving in one direction, going from home to the office to the nightclub to home to the office, like those old cartoons where a character walks past the same lamp and table over and over again. You meet some cute person (“goin’ my way?”), and fall in love. Around age 30, you have a baby. Your child starts traveling with you, by car, train, and plane, a little closer to the sun each day. If people reproduce about 1/3 of the way into their lives, it would take somewhere between 50 and 75 generations for your family to arrive at the surface of the sun. If you were born in the time of the Roman Empire, but with a modern life and an average 2014 commute, your descendants would be arriving about now. And, so it is with email. 150 billion is an impossibly large number, and that’s each day. If you printed one day of the world’s emails out, the stack of paper would be 10,000 miles high. A month of them would reach to the moon. The average email is 75 kilobytes (except spam, which is about 5k and 69.6% of traffic), which means a day of email traffic is about 4 petabytes. There’s 2.3 billion email users worldwide, and the average mailbox stores 8,024 messages. If we assume that most spam gets deleted, that puts the world’s total volume of stored email at 1,400 petabytes. Put another way: globally, we store about one year of email history. What can we compare this to in order to understand it? The web is pretty big, but since it’s public we all have a sense of its vastness. It’s also hard to define: there’s sites like CNN.com, Wikipedia, or your favorite Taylor Swift forum, but what about your company’s intranet, your calendar app, or the configuration page for your fancy new bathroom scale? Also, with services like Gmail, the web includes most of the world’s email too. A good definition of the web might be, “the stuff you can find by searching it.” Researchers call this the indexed web. Google says the web contains 30 trillion unique URLs. The average web page contains 96 of those objects, and is 1.6 megabytes in size. That puts the size of the indexed web at around 512 petabytes. 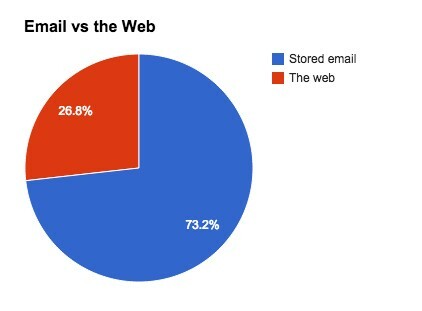 So, email is about 3x the size of the web. Remember that number from before? 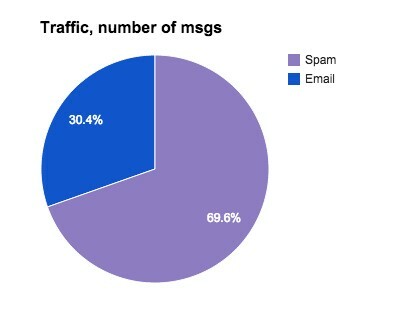 Email traffic is 69.6% spam. 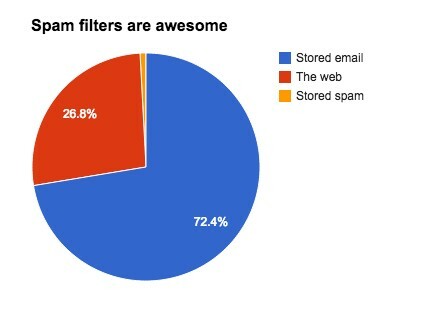 If there’s 3x as much as email as there is web, there’s 3x as much spam as there is email! A previous version of this article segmented out spam, but didn’t account for its size or deletion rate. So, you may see a much more alarming version of this chart floating around. Sorry about that! I’m always so impressed with how effective modern spam filtering infrastructure has become. Bringing this back to the personal level, it’s suddenly no surprise that some days, I spend half my time online reading email. In a sense, that’s okay: the ability to contact exactly the right group of people whenever I want is like a new superpower, and I shouldn’t take it for granted. But, I also think that for something that accounts for more than half of the Internet, email is pretty janky. We don’t collectively spend nearly enough of our resources making it work better. Predicting that email is dead, to be supplanted by (choose one of: Facebook, Twitter, Asana, Yammer, Skype) is like saying apps are killing websites. The comparison only makes sense when you compare a creaky old site to a slick new app. Modern email has a lot of advantages over more proprietary solutions, not the least of which is its ubiquity. When I look at the numbers above, it seems like fixing email is a way simpler project than replacing it wholesale. And really, we’re unlikely to be successful in replacing email. New communication technologies are accretive. The Internet’s been huge for a decade, and we still have telephones. When the phone was introduced, telegrams became largely irrelevant, but they stuck around for another hundred years. Do you remember the last fax you sent? Because I sure do (thanks, Anthem Blue Cross!). Email isn’t dead. It’s just sleeping. Put the coffee on, because it’s time to wake it up!